Vijaya Bank Recruitment 2018 / Various Office Assistant Posts: Vijaya Bank has published Recruitment notification for the posts of Office Assistant Vacancies. Apply online before or on 13 August 2018. More information please read below mention official notification carefully. Educational Qualification:- Graduate in any Discipline and Post Graduate viz. MSW/MA in Rural Development / M.A. in Sociology/Psychology/BSc (Agriculture)/B.Ed. etc shall be preferred. Shall have a flair for teaching with computer knowledge & Ready to travel extensively in the district. Age Limit:- Minimum 20 years and maximum 45 years. Pay Scale:- Candidates will get salary as per rule. Grade Pay:- As Per Rules. How To Apply:- Apply Official website page at www.vijayabank.comVijaya Bank Recruitment 2018. 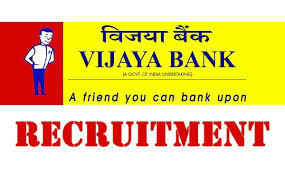 Vijaya Bank Recruitment – www.vijayabank.com.